Papua New Guinea lies entirely within the tropics, with a total land and sea area of over 2.2 million square kilometers (870,00 sq. miles). The mainland is split down its length by a massive mountain range, including some of the highest peaks in the Pacific, many over 4,000 meters (12,500 ft) high. Much of the country, except for the intensively farmed highland valleys, is covered by tropical rainforests, alive with orchids, brilliant butterflies, ancient mangrove swamps where crocodiles are still seen, or wide savannah grasslands, teaming with cassowaries, wild duck, wallabies and deer. The mainland, like the many islands large and small, enjoys the protection of coral reefs, and fine sandy beaches abound. The seas offer bountiful harvests - skipjack, tuna, marlin and other game fish, barramundi, crayfish, crabs and prawns and a wide variety of tropical fish, The people, who number more than 3 million, are largely of Melanesian stock, though some show signs of Polynesian or Micronesian ancestry. Although a total of about 700 languages are spoken, English is widely taught and used and Neo-Melanesian Pidgin and Hid Motu are understood by many people. Fully independent since September 16, 1975, the country has a freely elected democratic government. Papua New Guinea became the 142nd member of the United Nations in 1975 and is also a member of the British Commonwealth. Rich in natural resources the country derives much of its revenue from copper, timber, copra, coffee, tea and cocoa. Industry is being developed rapidly, there is a keen interest in tourism and the National Office of Tourism was re-established in late 1983. From the time I left my house on Thursday night to the time I arrived at the hotel in Rabaul, I had spent over 41 hours in transit. I flew from Los Angeles to Houston, through Narita, Japan on to Port Morrisby. There are better routes that take less time, but I chose this ticket on price alone and was traveling with a friend I met up with in Houston. From the US, Papua New Guinea is on the other side of the International Date Line so we immediately lost a day on the way there, but gained it back on the way back. Port Morrisby is your port of entry into Papua New Guinea via Air Niugini, who flies from Cairns daily, Brisbane five times a week, Sidney and Singapore twice a week and Manila and Narita once a week. This airline has very strict baggage rules, less than most other airlines, but does offer an extra baggage allowance of 33 lbs for scuba divers. This hardly makes a dent in what most underwater photographers typically travel with. The carry-on allowance is a strict one item per passenger, not to weigh over 7 kilos. We were detained for two hours because of the extra and overweight carry-on bags we had (cameras and lenses which I refused to check). Finally with higher management’s approval, we were given special permission to carry them on. Once we got to the gate, there were few passengers that had less than two pieces and they didn’t hassle anyone about it. They did weigh every passenger with their carry-ons before boarding. Upon arrival in Port Morrisby, passengers are required to purchase a Visa (100 kina or $36 US). This can be done before your trip, but you must send in your passport and the process ends up taking much longer and costing more than if you simply do this when you arrive. Be sure to have a full blank page in your passport for this Visa. Exact change will make the process much smoother. From Port Morrisby Air Niugini continues on to nearly all areas of Papua New Guinea. After traveling for almost a day and a half, we joked that we might be getting a bit "ripe". There was no place to shower along the way and we still had one more flight to Rabaul. When we boarded we realized we smelled like a couple of flowers compared to the other people on the plane. The locals don't use deodorant or soap. Until smell can be added to a web site or travel brochure you'll only experience this once you arrive. Wouldn't make for a good "scratch-n-sniff" anyway. Our first stop was Rabaul on East New Britain Island where we would stay for one night before we boarded Star Dancer. 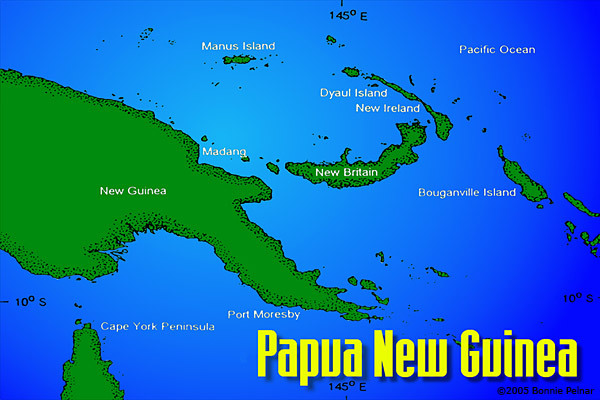 Rabaul is located on the Gazelle Peninsula at the northern tip of New Britain Island, about a 90 minute flight from Port Morrisby. Like many Pacific Islands, this area was overwhelmed by war in 1942. Although protected by a small Australian garrison, Rabaul was attacked and converted into a fortress and major supply base as the Japanese planned their explosive invasion into the mainland of Papua New Guinea, Australia and the Solomon Islands. The pumice hills of Rabaul were honeycombed with over 360 miles of tunnels used by the Appeases to store supplies and equipment, build hospitals and house troops. 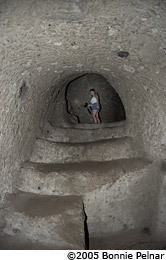 Indians captured at Singapore and locally were forced to work as prisoners of war, digging these tunnels, resulting in extreme hardship and death for many of them. Women were held as slaves and were repeatedly raped by the Japanese. Few prisoners escaped. Many memorials have been constructed to honor those lives lose while defending this area. In spite of its tragic history, Rabaul became known as one of the most beautiful islands in the South Pacific until September 1994. Mt. Tavurvur in Rabaul erupted, covering the town with ash burying homes and businesses. Fortunately nobody died in this natural disaster, but it destroyed the town. There is still evidence of this seen everywhere. Still today the volcano rumbles, venting huge plumes of smoke over Simpson Harbour. The rain-soaked ash layers the ground like a slab of black cement. Plants thrive from the new soil and heavy rainfall, so everything is lush and tropical. During days of heavy volcanic activity and easterly winds most everything in town is covered with a thin layer of ash. Our first night was spent at Hamamas Hotel, a small hotel with a colorful and historic background. 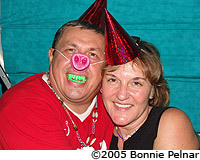 The manager Susie McGrade, is an Aussie woman who took over the hotel from here father who purchased it in the 1980’s. She grew up here, so she was bundle of information and ideas on things to do in the area, the most obvious being a visit to the market and to get a closer look at the volcano. The hotel rooms are large, clean and comfortable with phones, TV and a fridge. The on-site restaurant serves a complete menu for breakfast, lunch and dinner as well as daily specials and a Chinese menu. The lounge and video arcade is open to those who might enjoy a cold SP. The market opens daily and attracts a large crowd of locals. We were the only white people there so we became part of the entertainment. Vendors sold fruit and vegetables, betelnut, lime and pepper, tobacco and a few had bilum bags, shell money jewelry, sarongs and local dresses that were as figure-flattering as a Hawaiian mumu. There are also many supermarkets in the area, full of everything you could possibly need from underpants to car tires to machetes. Local diving is available with a land-based operation either before or after getting on the live-aboard. North of Rabaul, Kabaira Dive offers guided trips for groups of six or fewer people. A two-tank dive costs around $72 and the guide Stephen Woolcott will take you anywhere you want to go. Backpacker type accommodations are available near the dive shop, but Steve also serves the three hotels in Rabaul. For more information, visit www.kabaira.com. We boarded Star Dancer from the docks right in town and got settled in our staterooms. Star Dancer is a 120 foot mono hull vessel that accommodates up to 16 passengers in eight cabins. Captain Alan Raabe was our host during our visit, which made this trip all the more interesting. Those who have sailed with Alan will almost always beg to come back for more. Our crew included Andrew, Josie, Helen, Oscar, Nelson, Lynn, and several other locals who helped make our trip absolutely wonderful. April through December has better weather on the North side of the island between Rabaul and Kimbe Bay, so Star Dancer visits the south coast in January, February and March only. Trips are all ten days long. These trips started as exploratory, but soon blossomed into one of the most diverse and fascinating destinations for the underwater photographer who is looking beyond the typical tropical muck diving. Star Dancer has been doing this trip since last year so only a handful of divers and even fewer photographers have had the opportunity to go here. We were very fortunate to see this amazing area which is so unaffected by over fishing, over diving, anchor damage or natural disasters. OUR SHIPMATES: Bonnie from Under Watercolours, Donna from South Pacific Island Travel, Sue from Peter Hughes Diving, Marty & Jeff, and seven Russians (half could speak English). What impressed me most about this area was the diversity in both wide-angle and macro opportunities. I’ve traveled extensively to Indonesia to the areas of Manado (Bunaken, Bangka and Lembeh), Wakatobi, Bali, Lombok, the Band Sea and Komodo and although each has its high points, no one area has all the things we would see here. The walls and bommies were absolutely amazing. Most of the walls were steep and layered with treats at every depth. Massive gorgonian sea fans covered the deep slopes. Some fans were 20’ wide and all were very healthy. There were so many of them that it was difficult to navigate between them to take pictures. 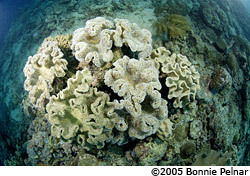 Further up the reef we would find huge patches of cabbage coral and staghorn coral. Closer to the surface, the area was covered with the most healthy, clean coral I’ve seen anywhere, also home to many species of anemones and their resident clownfish. What’s even more surprising is the number of fish seen here. Huge schools of Barracuda, Unicornfish and Jacks circled us. In several areas we would encounter large bump-head wrass in numbers. Groups of 15 to 20 batfish were also encountered at some of the dive sites. This was the most noticeable difference between this area and all the areas of Indonesia I’ve visited. 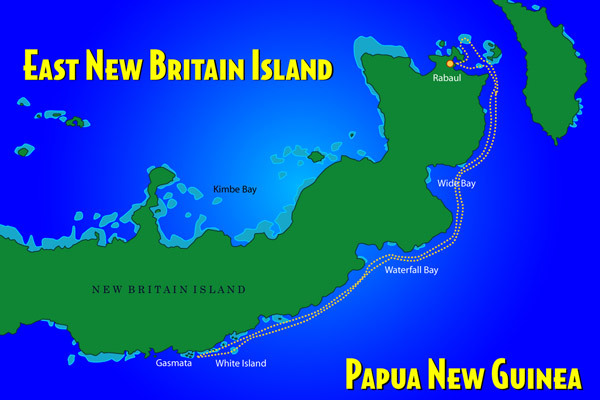 The reefs of New Britain Island have not been fished out. Making the decision of which lens to put on my camera and housing was often difficult for these wall dives. The macro life on the reefs was equally as exciting as the wide angle. Since I seldom see such amazing wide angle opportunities, I decided to save the macro for the afternoon muck dives. The walls around the small islands would curve off to finger the sandy bottom channels that were scattered with bommies teeming with life. Some of the fans here were even larger than on the walls and the trees of dark green tubastrea coral were 12 feet in height, surrounded by colorful sea fans and soft coral as far as the eye could see. This dive was done directly off the back of Star Dancer. We descended to a mound that sloped down to a sandy bottom at about 60’. 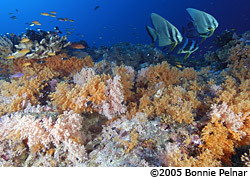 Common here are many varieties of large anemone and their clownfish residents, rock mover wrass, lionfish, turtle, long nose hawk fish, dwarf hawk fish, anthias, lots of hard coral, huge gorgonian sea fans, whip coral, some small areas of soft coral. The green and yellow Rhinopias was easy to find at the base of the mooring. Visibility on the first dive was down as the current seemed to be slacking off, but on the second dive the water cleared up so we ventured a bit further to find a huge area of brilliant green cabbage patch coral. 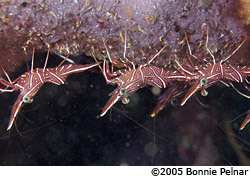 Josie found a Harlequin Shrimp and Oscar helped to find squat lobster in the feet of chrinoids. Things seems to be waking up as many schools of fish moved in. Water temp here was 84 degrees Fahrenheit. Star Dancer moved to the other side of the tiny islands into a shallow channel. This anchorage is protected by tiny islands so its very calm. Local children paddled around the blue-green water in their canoes and we geared up for our first muck dive. The bottom is mostly silt with lots of coconut husks and logs, littered with very pretty shells and a few bundles of sponges and coral. Divers also spotted a large anchor, anemones, cuttlefish, a small eel, whip coral and a small ray. The water temperature here was about 85. Overnight we motored further west to White Island. The trip was very calm and comfortable and we pulled in around 9:00 in the morning for our second day of diving. We descended to about 80’ down the wall around the tiny spit we were moored behind. The wall continued even deeper but with four more dives ahead of us we chose to be conservative. The wall was covered with very healthy crinoid covered gorgonian sea fans, red whip coral, orange and red sponges, barrel sponges, giant trees of green tubastrea coral, large sheets of leather coral and forests of large sea whips, teeming with bannerfish, Moorish Idols, parrotfish, jackknife fish, wrass and anthias around it all. On the second dive we diverted through a cut through the top of the reef to find white sandy bottom between long fingers of coral mounds covered with beautifully healthy soft coral, hard coral and sea fans. Visibility was over 100’ as we worked our way back to Dancer. Several large buffalo parrotfish cruised around the sandy bottom, but our dive guide Nelson told us it was common to see larger congregations of them here. The beautiful reef, warm water and great visibility made us feel like we were diving through an aquarium. When we returned to the boat we were greeted by the local people, who had paddled up in their dugout canoes loaded up with the whole family, all wearing the red toothless smile commonly seen as the result of chewing betelnut. The afternoon and night dives were done on the reef under the boat so we could dive at our leisure. The area was a continuation of what we saw in the morning, but sloped off to deeper water on the other side of White Island. 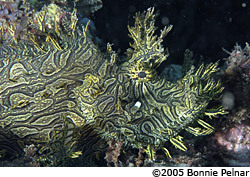 Here we found large sheets of green leather coral which was home to several harlequin ghost pipefish. In the rubble area we found many mandarinfish and a large cuttlefish cruising around the divers. Steep wall runs all the way around the ocean side of White Island and continues down to the east and west. Around the west side of the island are several large bommies with white sandy valleys between them. Most are covered with huge sea fans, trees of green hard coral, and more soft coral than I’ve ever seen in one place before. Schools of Moorish idols were everywhere, and a large school of barracuda hung around most the dive. 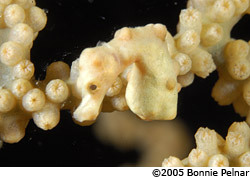 On a later dive we went back with our macro setups to shoot pigmy seahorses on a fan at about 70’. There was a bit of incoming current. West of the mooring at White Island about 20 minutes in the Magic Bus we entered the water and descended down the wall, but quickly crossed over to a channel with fingers of bommies on both sides. 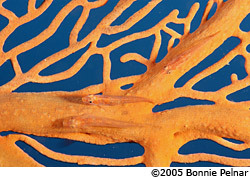 The bommies were covered with gorgonian sea fans and soft coral. 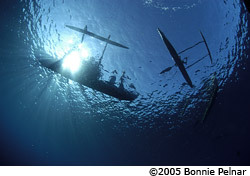 Upon seeing our arrival, the local children quickly paddled their dugout outrigger canoes to greet the divers at the surface. Currents picked up in the middle of the channel and a large school of Barracuda congregated. A short cruise further to the west took us to another island area called Gasmat. Star Dancer picked up a mooring outside of the area and we used the Magic Bus to get to the dive site, which was a channel located between several small islands. We were quickly surrounded by locals who protested our presence. After negotiations between our Pidgin-speaking guides and the village chief, we were permitted to proceed with the dive. The water was green and the bottom mucky, but small bommies full of soft coral, hard coral and fans were home to hundreds of interesting critters. One of my favorite muck dives of the trip, Linden Haven was our anchorage for several nights. The small village is home to locals and missionaries. The small jetty and sandy area around it is home to some rare and fascinating creatures. We had the opportunity to do several dives here as well as night dives. A large metal box discarded by the village created an artificial reef, which was in itself worth spending the whole dive on. Early in the morning Star Dancer motored out to a sea mound in open water they called Secret Bommie. We descended down the mooring line through a ripping current at the surface and lots of jellyfish. The top of bommie was flat with much less current. It was covered with soft coral as far as I could see. Large school of jacks, unicornfish, and several large schools of barracuda were overhead. A group of about 30 batfish, swimming sideways into the current, congregated near a large table coral shelf. I spotted one small white tip shark and one Napoleon wrass. 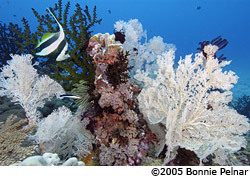 Several areas of the bommie were covered with large plates of hard coral with heaps of soft coral growing underneath. Formerly a Taiwanese tuna fishing vessel, the the Atun was purposely sunk by the Rabaul Dive Club in 1983. It is situated on a ledge near Rabaul in approximately 70 ft. of water with the profile reaching just 25 ft. below the surface. She sits perfectly upright and is still mostly intact but some fittings have been salvaged. 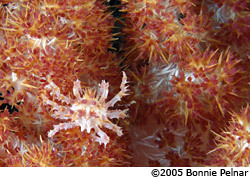 The wheelhouse is full of soft coral and black coral. This was a great dive for both wide angle and macro. By now we're all pretty good at finding the critters, but Josie and Oscar still never cease to amaze me with their local ability to find those little creatures we have yet to see such as more species of anemone fish as well as Mantis Shrimp, nudibranchs, and swallowtail seahorses. 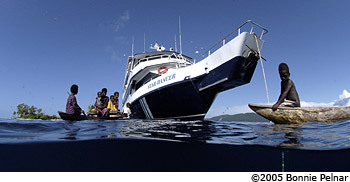 Sad that this was our last dive, we packed up our gear as Star Dancer motored back to Rabaul. As we cruised into Simpson Harbour Tavurvur greeted us with large plumes of dirty smoke. The dive gear we put up on the top deck was quickly covered with ash even before it was dry, but we had until the next day to clean it all off and let it dry. With time to spare before our departure, we spent the afternoon doing some tours to soak up more local history. We visited Japanese bunkers, a local village, a scenic viewpoint that overlooked all of Rabaul and several other historic sites. It was VERY HOT and HUMID, especially inside the bunkers, but the tours were interesting and worth the money. The last night of any live-aboard trip is usually the most fun, but this trip was especially memorable. It was my birthday! Probably the best one I've had in years, thanks to Captain Alan, the crew, my friends Donna and Sue, and of course the Russians. I knew they would do something special, but I had no idea what. No sign of any shenanigans during our last dinner, but Donna quickly swept me away with an after dinner emergency down in my cabin that needed my immediate attention. Upon my return to the lounge, the entire room was decorated, everyone was wearing plastic animal noses and pointy hats, and Helen had baked me the most intriguing birthday cake ever...let's just say it was more chocolate and whipped cream than I've ever seen in one place and it was anatomically correct! Since the Russians had drunk all the best liquor on board, they had to make due with the local Vodka, which tasted more like kerosene. We were out of tequila, but that didn't seem to damper things. We partied into the night. Captain Alan entertained us with dancing and "spoons" music. The next morning we finished packing our things (all suffering from some serious hangovers) and proceeded to the airport. We were all on the same flight back to Port Morrisby, so we said goodbye to the Russians and caught our flight to our next stop, Tawali. More information on Tawali and Loloata will be online soon. For now, enjoy our Quicktime slideshows: Tawali & Loloata.